There are an awful lot of L - numbered plecos that have a basic black with many white spots colour pattern. This is one of the more commonly seen fish with these colours. Some specimens can exhibit a more yellow tinge to the spots and this appears related to water conditions. When it was first offered for sale (before it was assigned its scientific name) the fish was also labelled as the Tusken or Vampire Pleco, since classification the common name Galaxy pleco has become more often used and for the sake of continuity it is adopted here. Additionally, the tusken and vampire features (a strange bony growth on the fishes head and it's fang like teeth respectively), are characterisitic of the genus and don't identify this species clearly. Although its colouration is not unusual, it is however odd in that it has a large front "tooth" - the use of which is unproven - although a few theories exist. The specialized dentistry is not for rasping algae from bogwood - I did not notice any tell-tale toothmarks (like those left by Royal Plecs, Panaque nigrolineatus) on any bogwood present in the tanks with these fish. It also was a poor green algae eater in the way, for example, a common pleco is not, although it did make some impact on brown algae. Maybe the "tooth" (you can see it protruding out of the top of the fishes mouth in the out-of-water shot below) provides some function in the fast water environment that the fish hails from and it is under-utilized in the home aquarium. I personally favor the idea that it is used to gain access to crustacea, molluscks or insects embedded in rotting wood or thick algae. The fish does eat meat and can despatch a frozen prawn in record time (for a pleco). 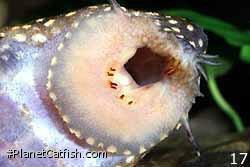 It is also reported by other keepers of these fish that they eat snails too. 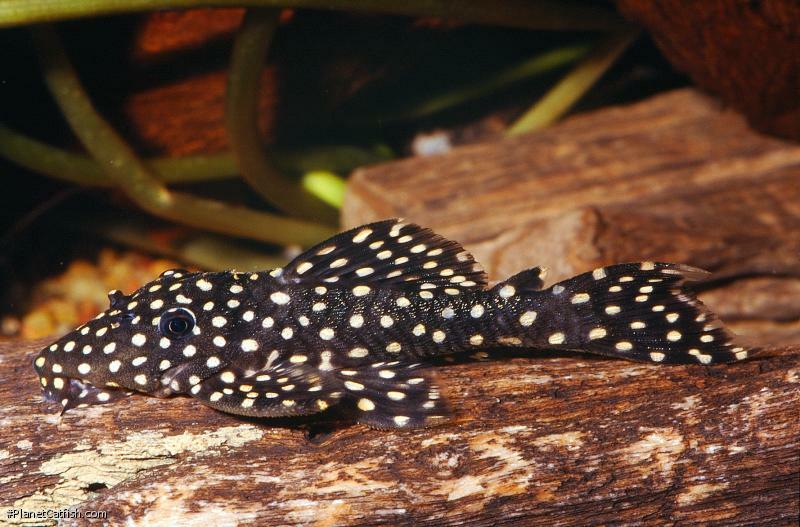 It is a territorial fish; I had real problems keeping it with a Polka Dot Catfish, Synodontis angelicus, but in hindsight keeping two similarly patterned "warmongers" together was not a good idea. In order to avert an aquatic world war III, I swapped out the S. angelicus for a S. alberti which did happily coexist with the Galaxy Pleco. This underlines the extra thought required when mixing two species of fish that would never encounter each other in nature." Type Locality Rio Tocantins, Lagoa em frenta a Jacobal, Pará State, Brazil. Etymology Latin, lepus, leporis = rabbit + Greek, akantha = thorn. This specific epithet refers to its milky (galaxias=milky or milky way) white spots. L. galaxias (L029) is distinguished from L007 (L. cf. galaxias) by its lower dorsal fin, a longer snout and smaller spots. Distribution South America: southern tributaries of the middle and lower Amazon, Madeira, Tocantins and Guamá rivers; also known from the Ventuari River basin in the upper Orinoco drainage. Feeding Prawns and Snails are top of the menu, but the fish will learn to eat most off-the-shelf foods. Furniture Prefers bogwood and darker rocks. Not seen often during the day. Compatibility Gets on with small lively catfish but avoid other larger bottom dwellers (unless space permits) due to the territorial disputes. Breeding Has been accomplished but, sadly, not documented.